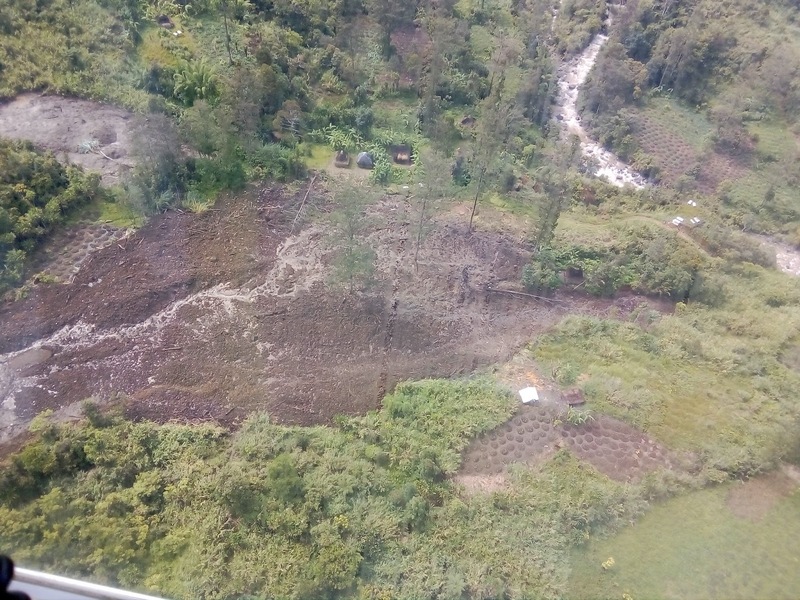 Timu village from the top showing the site where eleven people were buried by landslips during the earthquake on Monday 26th February 2018. Four of the bodies have been recovered, seven are still buried including five children. 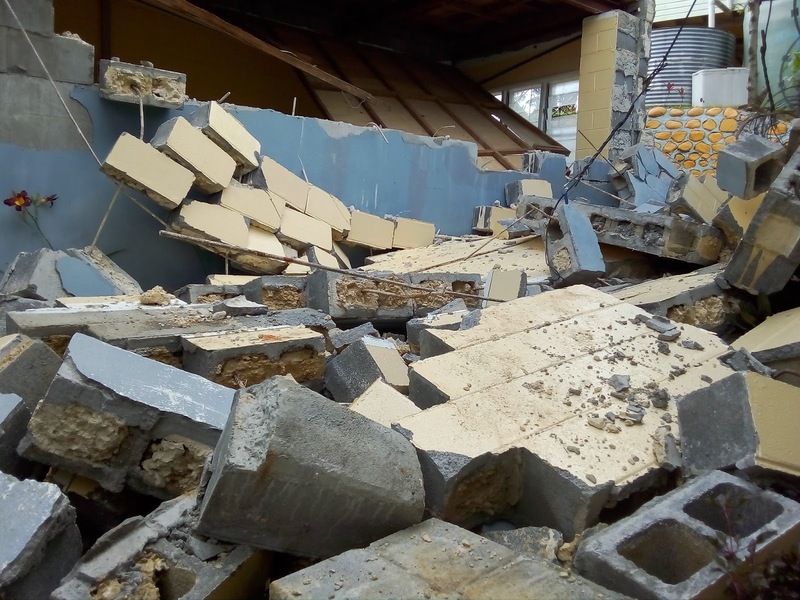 The Highlands Earthquake Disaster has brought to light some of the many things that need to be considered in assisting those affected by disaster and restoring vital infrastructures and communication links between relief agencies and the people. The response to the disaster took almost a week for the National Disaster Centre to find out statistics of people who were affected, casualties, homes and food gardens destroyed and how to deliver relief supplies to those affected. While a small team of medical officers in Hela and Southern Highlands provinces have been hard at work trying to reach and assist the affected communities, more deaths and injuries were reported from areas unreachable by road and telecommunications. - Most communities do not have schools, clinics and ward offices that will keep the records of people in their wards communities. - No road links to almost all the areas affected. The rugged terrains also makes it difficult for roads to be constructed and maintained. - No telecommunication receptions, television and radio signals of which the people can be advised and educated on the disasters and how to avoid destruction. At Timu village in Komo-Magarima Hela province, eleven people were were killed by landslips caused by the 7.5 magnitude earthquake on Monday 26th February 2018. Four out of the eleven bodies were recovered while the other seven bodies are still buried under the debris. Timu village is just a few tens of kilometres away from the provincial capital Tari but it is way back in terms of basic services availability for the people. The people knew that there’s a gas pipeline running through their neighbouring villages from Hides to the Papuan coastline but they haven’t seen the benefits from the gas and petroleum extractions in the province. 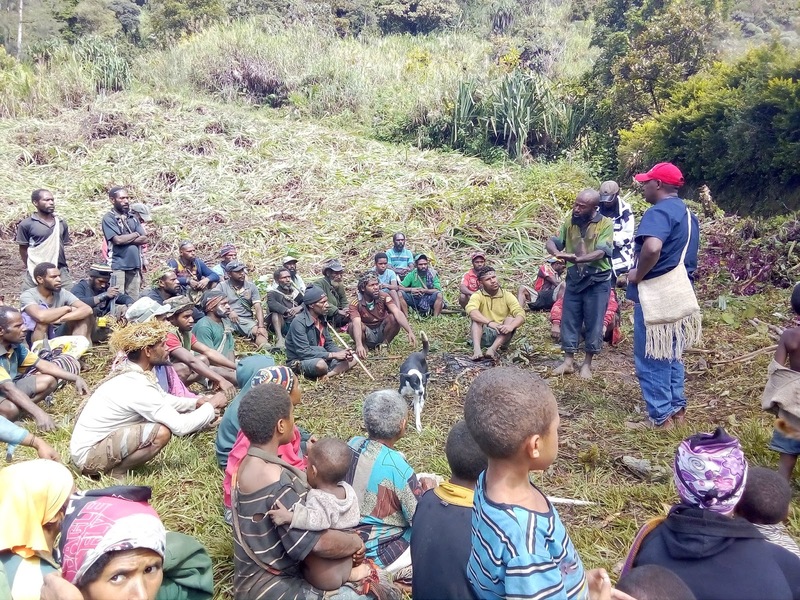 Displaced Timu villagers in Hela litening attentively as a local translator advises them on the visit by Tari Hospital Doctor Tana Kiak (with red cap) during a visit to the village this week. statistics of people who have been affected, but they can only be flown by helicopter into the affected areas. There are no medivac helicopters to transport relief supplies and doctors into the affected communities. The PNG Defence Force, Missionary Aviation Fellowship (MAF) and Adventist Aviation Serices were kind enough to do trips into these remote communities. The cost of hiring a helicopter in PNG is quite expensive. Helicopter companies are charging around K5000 for an hour. With most communities being isolated in the remote areas, it is costly and ineffective to attend to more than five villages in a day. The Australian Defence Force Hercules Aircraft transporting relief supplies from Port Moresby, Lae and Mt Hagen has been landing at the Moro airport, then smaller aircrafts bring the supplies back to Tari and offloaded onto helicopters to distribute. 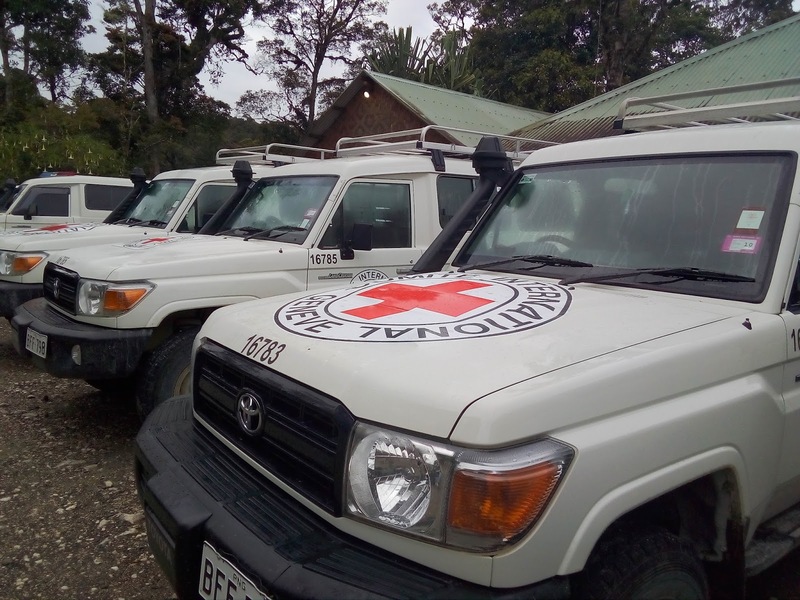 Disaster response in PNG has been very slow and hasn’t improved from previous experiences. In February 2018, I was in Wewak when a volcanic island began releasing smokes after being dormant for more than two centuries. 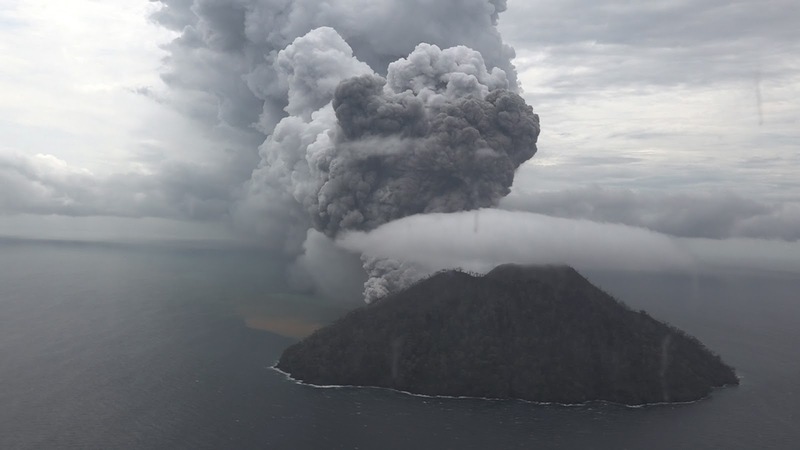 The Kadovar Island volcano has displaced more than 600 islanders who are now seeking refuge at a temporary care centre supported by aid agencies. Again the experiences from the Manam volcano in Madang hasn’t helped the authorities to sort out a permanent resettlement area for the displaced islanders. Slow response from the National Disaster Centre has caused greater loss for the people in the last three years. They’ve lost their culture and they have lost their way of life on the Manam island while living at the care centre at Bogia. The National Disaster team should be the first people on ground after the disaster strikes. They must be the first to make contact with the affected people, not turning up a week later only to find out that people died whicle waiting to receive treatment. I hope the present disaster will provide an insight into issues that needs to be addressed by the government to ensure the National Disaster Centre is adequately and constantly funded to serve it’s purpose.